Craving some chicken strips? Here is a healthier version that still has all the flavour you could want. I have a weakness for chicken strips and nuggets of the deep fried variety. So I decided I should probably make a few tweaks to health it up a bit, and did so by making a whole wheat coating and baking them in the oven. I paired it up with some hot mustard dip and I do have to say, they were not too shabby, not too shabby at all. 2. Place baked bread cubes, garlic powder, paprika, parsley, and grated parmesan into food processor and pulse until desired texture for chicken strips coating is reached. Pour into a bowl and stir in sesame seeds. 3. Turn oven up to 400º. 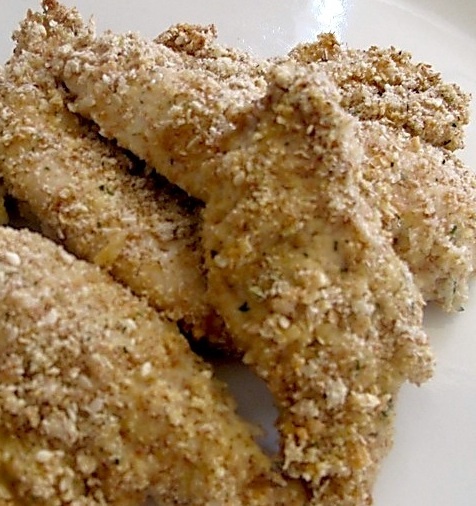 Coat chicken strips in egg and then coat with breadcrumb mixture. Place on a lightly greased baking pan. 4. Bake for about 20 mins. This entry was posted in Chicken, Mains and tagged baked, breaded, chicken, chicken strips, healthy, whole wheat by Karina. Bookmark the permalink.